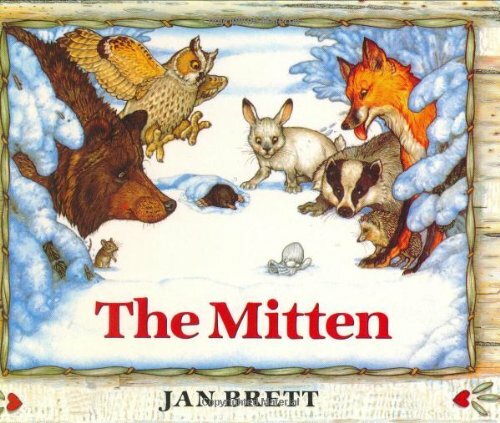 The Mitten by Jan Brett is one of my absolute favorite winter stories. This retold Ukrainian folktale tells what happens to Nikki's new, white mitten that he loses it in the snow. The mitten becomes home to a rabbit, a hedgehog, an owl, a badger and a fox before getting completely stretched out by a bear seeking refuge from the cold. The breaking point happens when the smallest animal of all, a mouse, crawls in and tickles the bear's nose, causing him to sneeze and the mitten to fly away. Luckily the slightly stretched out mitten lands right in Nikki's path, so Baba is unable to scold him for losing his brand-new mitten. What makes this book so great you ask? Well, first off Jan Brett is a very talented storyteller and illustrator. She has a distinct style and I love the way she shows other details about the story. For example when all of the animals are piling into the mitten, you can see what Nikki is doing in a little mitten on the side border or what animal will come next. The other great thing about this book is that it lends itself well to follow up. Younger children can make their own mittens out of construction paper or felt and retell the story using animal cut outs. If I knew how to knit I would surely knit a white mitten and get little stuffed animals to put in the mitten to retell the story. (I still might do that one day). Older elementary readers could use the illustrations to predict what is going happen next or write side stories about what adventures Nikki goes on while his mitten is missing. The possibilities are endless. So whether you're enjoying the cold weather or looking for ways to stay warm on a cold winter's day, The Mitten is a great read by itself or with follow up activity.